Are you looking for a unique way to brighten up a room? We carry a broad selection of lodge chandeliers and some art glass chandeliers too that are perfect for your lodge or cabin style home. Choose from American-made metal (steel, iron, and copper) chandeliers from Steel Partners, Colorado Rustic Lighting, Mica Lamp Company, and more. Our antler chandeliers are entirely American made and feature creative designs with shed antlers from deer, elk, and moose. If your taste leans toward log, we have hickory chandeliers from old hickory to meet your needs. Our American manufacturers produce exceptionally well-crafted log cabin chandeliers. LodgeCraft also carries art glass "Tiffany" chandeliers and some rustic chandeliers that are handmade, in factories overseas. We have selected only the finest import chandeliers to ensure the quality and value that you expect from LodgeCraft. Whether you are looking for a fancy chandelier that will fit nicely in your cabin or rustic home, or an art glass chandelier for your commercial restaurant, you are sure to find that perfect chandelier you have been looking for at LodgeCraft. Can't find quite what you are looking for? 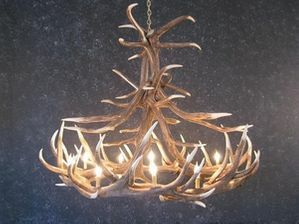 Contact us for more options, as we have many rustic lodge chandelier vendors that we do not display online. Just give one of our friendly furniture experts a call and we will be more than happy to accommodate your requests. Thanks for choosing LodgeCraft as your primary source for log cabin chandeliers! Chain Uplight Chandelier - 20"
Hook Uplight Chandelier - 20"
Tube Uplight Chandelier - 20"
Large Mission Chandelier - 24"
Lantera Single Tier Chandelier - 14"
Lantera Single Tier Chandelier - 27"
Lantera Double Grand Chandelier - 27"
Los Feliz Rancho Chandelier - 16"